Get daily protection from sun damage with NEUTROGENA® ULTRA SHEER® WATER-LIGHT® Daily Face Sunscreen SPF 60. This oil-free and lightweight liquid sunscreen delivers effective sun protection with its water-light texture that spreads easily over skin, absorbing instantly for a weightless feel. It also provides an even, non-shiny finish that works beautifully alone or under make-up and moisturizers, so your face is always protected from the sun. Non-medicinal Ingredients: Adipic Acrylates/Dimethicone Copolymer, Ascorbic Acid, BHT, Bisabolol, Butylene Glycol, C12-15 Alkyl Benzoate, Camellia Oleifera Leaf Extract, Caprylyl Glycol, Cetyl Dimethicone, Chlorphenesin, Cyclopentasiloxane, Diethylhexyl 2,6-Naphthalate, Disodium EDTA, Ethylhexylglycerin, Mannan, Neopentyl Glycol Diheptanoate, Pantothenic Acid, Parfum, Pentylene Glycol, Phenoxyethanol, Polyester-7, Polymethyl Methacrylate, Portulaca Oleracea Extract, Retinyl Palmitate, Silica, Steareth-100, Steareth-2, Styrene/Acrylates Copolymer, Tocopheryl Acetate, Water (eau), Xanthan Gum. excellent for everyday protection. It's really light and protects even under make up. 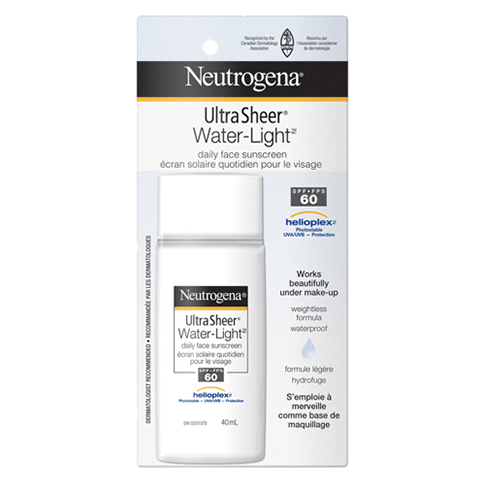 Neutrogena is my go to brand for sunscreen. This Neutrogena facial sunscreen in spf 60 is an excellent choice for skin protection. I use it year round - in the summer when it's hot out, but also in winter when skiing as there is reflection of the snow when doing outdoor activities. It feels light and not thick when you apply it. Love that this is a 60 spf, so great for vacation, a bit expensive though. Works great, good sun protection but expensive simply because it is labelled "face".